The developers have staged a complete turnaround of the property, which not only was a victim of the condo crash but also was at the center of an alleged Ponzi scheme. 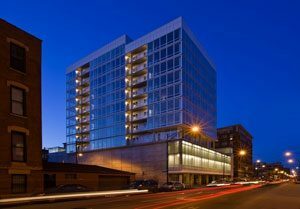 They converted the development into a rental building, a move that paid off amid a red-hot downtown apartment market and the West Loop’s renaissance. Origin and Randolph Street paid $16.8 million for the project in June 2013, when it was known as Pure Condominiums. They invested another $2.3 million to build out and reconfigure unfinished units, buy back four condos that had been sold and move its fitness center, Scherer said. Then the developers leased up the units at much higher rents than they expected. A growing list of investors have pocketed big profits in a very short time as downtown apartment values have jumped—and returns, or capitalization rates, have fallen—the past few years. While Lux24’s $35 million sale price represents an 83 percent increase in value, Origin and Randolph Street didn’t just ride the wave. Scherer declined to identify the buyer of Lux24, saying only that it’s an investor from Silicon Valley. The Origin-Randolph Street venture bought the building at 24 S. Morgan St. from United Central Bank of Texas, a Garland, Texas-based lender that in 2009 acquired the assets of Mutual Bank of Harvey. Mutual Bank, which provided the project’s developer, Chicago-based Sunrise Equities, a $20 million construction loan, repossessed the property in 2008, in the depths of the condo crash. Sunrise’s owners also were indicted that year on federal charges that they defrauded investors and lenders of more than $40 million. One of the owners pleaded guilty in the case and is serving a five-year federal prison sentence. Pure was one of the last of many failed downtown condo projects to be acquired by a developer and converted to apartments. While Scherer was confident the investment would pay off, it turned out much better than he expected. Origin forecast it could charge rents in the building of $2.40 to $2.50 per square foot over time, but tenants are signing leases now at $2.80 to $2.90, he said. Apartment rents have soared in downtown Chicago over the past three years, but demand is especially strong in the West Loop, which has emerged as a hot spot as technology companies like Google and Gogo have opened offices there and it has become even more of a dining and nightlife destination. As a result, other new West Loop apartment buildings, like Circa922, have fetched big prices from investors betting the area will only get better and rents will keep rising. “We’re drafting off the new product, but to some extent we’re keeping up with the new product,” Scherer said. How well Lux24’s new owner makes out will depend on how long the good times last. Developers are poised to complete nearly 9,000 apartments in downtown Chicago in 2016 and 2017, and demand, while strong, isn’t likely to keep up with the new supply. The new competition will make it harder for landlords to keep hiking rents, and some may need to offer concessions like free rent to fill up their buildings. “I think it’s reasonable to think that there will be a slowing of rent growth and some concessions to work through the supply,” Scherer said. Danny Spitz, managing director of Chicago-based Baum Realty Group, brokered the sale.